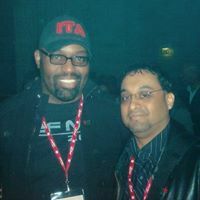 Frankie Knuckles "The Godfather of House" and DJ MIDIMACK in 2003 in Cannes, France. DJ MIDIMACK is a DJ/Producer from the San Francisco Bay Area (Oakland) and a 25+ year veteran (O.G.?) of the turntables and international club scene. He continues to travel around the world but created this podcast to share his music with those that may not have the opportunity to hear him play in person. He is passionate in his love of good dance music and is one of the few DJ's in the world that a 4 hour DJ set is just a "warm up" (his 8 hour+ sets were common-place "back in the day"). In any given set he will play music from the past, the present, and the future...but no matter what he plays you can be sure that it will be FUNKY! DJ MIDIMACK began his musical journey at the age of 10 years old in Oakland, CA when he first learned to "collect" his favorite records along with his teenage sisters (FYI: he later inherited most of his sisters records when they moved out - but don't tell his sisters!). There was a lot of music being played in the house in those days; Mom was playing a variety of Spanish music in the kitchen, Dad had his radio on in his workshop, and both sisters had their own radio and listened to different radio stations - the House was "Rockin'"! Music shows like Soul Train and American Bandstand were never missed and weekly radio music "countdown" shows were listened to and logged (yes, logged!). It was the teenage years that opened his eyes to many different music artists and genres. Bay Area radio stations began playing music from new unconventional artists like The Eurythmics, Sting (The Police), George Michael (Wham! ), Madonna and Prince (and many many more). Hip Hop artists like Afrika Bambaataa, Run DMC, The Beastie Boys, LL Cool J, MC Hammer, and Egyptian Lover were a big influence - at this time Hip Hop was not limited by style or tempo. Hi-Energy/Freestyle was the music of choice for local Latino teenagers, Punk Rock was blossoming in neighboring Berkeley, and "Modern Rock" was a must for many nearby college students. A LOT of new music was in the air! It was at a popular 18 & over San Francisco dance club (which he got in at 15 thanks to his older sister) called Studio West that DJ MIDIMACK saw one of the Bay Area's most influential club DJ's, Cameron Paul, spinning live that solidified the DJ bug. At that time Cameron Paul played music not available anywhere else except in Dance clubs (sound familiar? ), but he would soon become a staple on the radio as he introduced and popularized the mixshow format (a non-stop music mix show). It was in these years that DJ MIDIMACK honed his skills on the turntables and became a popular mobile DJ playing gigs throughout the Bay Area for Colleges (UC Berkeley, City College of San Francisco, UC Santa Cruz, UC Davis, Laney College, & others), High School dances, Weddings, Birthdays, and Quinceañeras. The 90's brought several multi-year residencies in San Francisco dance clubs (the longest being a 5-year residency in a bar in the heart of the world-famous Castro district), many radio guest appearances (KMEL in San Francisco, WCRX 88.1 FM in Chicago), and several permanent radio mixshow positions - KYLD in San Francisco and KMVR in Las Cruces, NM - where he would mail tapes (yes, tapes) to New Mexico from California every week for several years. Most importantly, the 90's brought the love for House Music. Soulful House Music. As Hip Hop started to take over radio, it was House Music and Raves that started taking over the underground dance scene. So many genres and sub-genres would come out of House Music (Trance, Garage, Hard House, Drum & Bass, today's Trap Music, etc.) but it all stemmed from this unique music born in Chicago (see Frankie Knuckles in Wikipedia - you're welcome!). But it was House Music that sparked a passion in DJ MIDIMACK that continues to this day. In 1997 DJ MIDIMACK moved to Chicago, the birthplace of House Music, to expand his knowledge and passion for House Music. It was on a previous visit to Chicago when he heard several House tracks being played during a morning radio show - not just domestic tracks either, they played imports as well! - that he realized he needed to move to Chicago. House Music was everywhere. One of his first jobs in his new home was at the Hip House record store. Not the biggest record store around but the quality of the music available was inspiring. That lead to a position at the now infamous UC Music (AKA Underground Construction) record label - one of the biggest House labels in the United States at that time - where he would promote records to DJ's around the country.